CCSEM sponsor Alliance Catholic Credit Union (ACCU) opened the doors to their newest branch on October 30, 2018. The new branch is in Southwest Detroit at the corner of Vernor and Junction, across the street from Most Holy Redeemer Catholic Church. The credit union renovated the first floor of the Albert Kahn designed Detroit Savings Bank building combining some of the original architecture with modern features. ACCU is excited to be part of such a vibrant area near several Catholic parishes and schools. They are fully committed to being an active, involved part of the community. 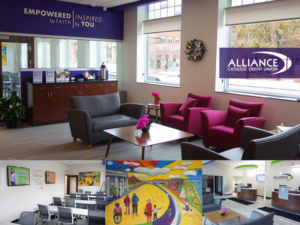 The full-service branch has an experienced, Spanish-speaking staff and a separate community meeting room featuring an original mural from local artist Vito Valdez. ACCU serves the Catholic community throughout the state of Michigan and has additional branches in Dearborn, Melvindale, Taylor, Rochester, Shelby Township, Sterling Heights, Troy and West Bloomfield. If you are interested in joining ACCU or to learn more about all they do for the Catholic community, visit AllianceCCU.com or one of their nine branch locations.